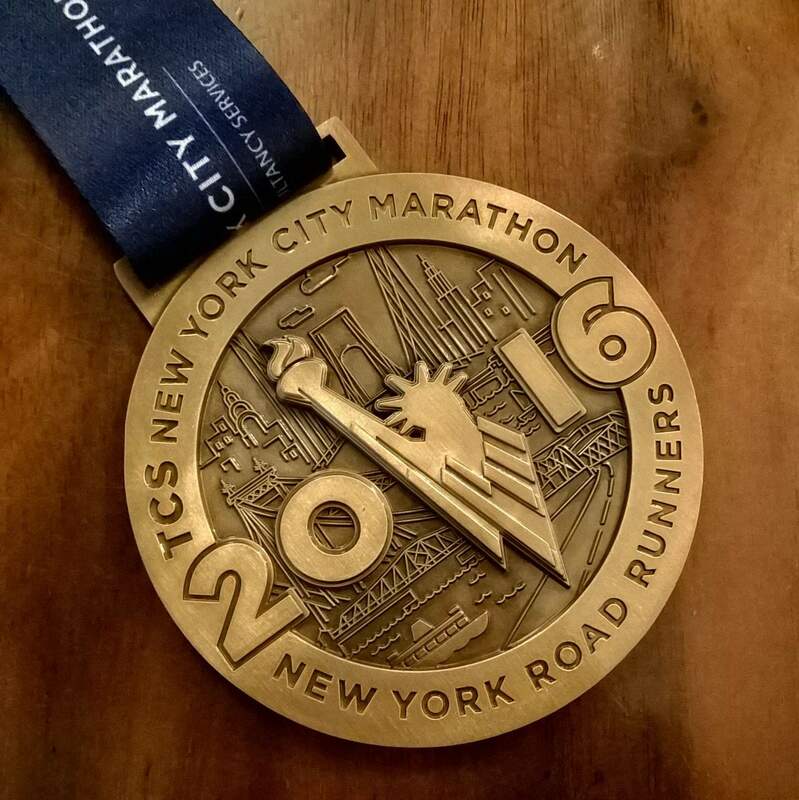 Earlier this year, some friends and I were talking about the New York City Marathon and how it is pretty difficult to get into. The marathon—one of the largest in the world—is so popular that the vast majority of participants gain entry by a $11 lottery in which lucky “winners” are then automatically charged $255 for the privilege of running the five NYC buroughs. 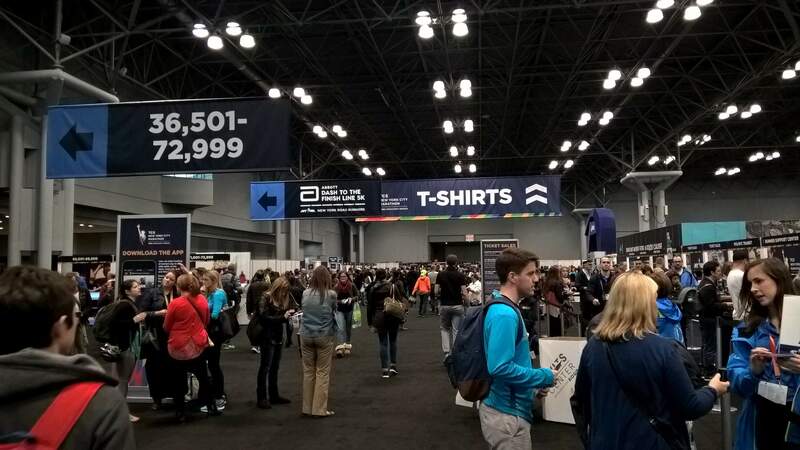 “I should start entering their lottery each year until I get in,” I said despite normally considering such a registration fee an outrageous charge for a distance I can run on my own for the cost of a couple granola bars. This particular race, after all, is one of the three U.S. Majors (the other two are Boston and Chicago). 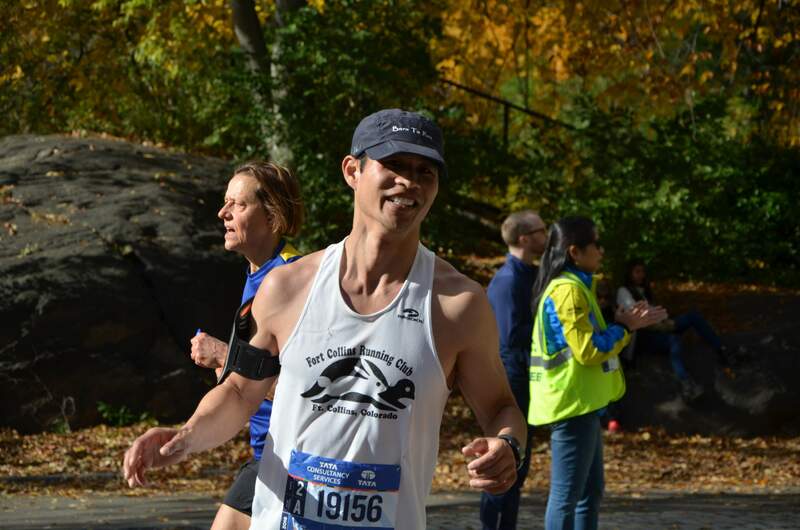 Even though I normally prefer smaller races, there was no question that for the state of New York, I was going to run the famous marathon in the Big Apple as part of my lifetime marathon states goal. So in mid-January I threw my name into the proverbial hat. I promptly forgot about it, then, until I saw on a March credit card statement the three-digit charge by the New York Road Runners. “I got in!” I realized. In the ensuing months, the race would provide the motivation to run regularly, culminating in some of my best running race results in years, starting with Ragnar Trail Angelfire in July. En route to racking up a few little league age group or overall race wins, I managed to do long runs of 13.1, 18, 20, 26.2, and 20 miles, and also run every urban trail in Fort Collins. All to train for New York. Finally, the big day came. 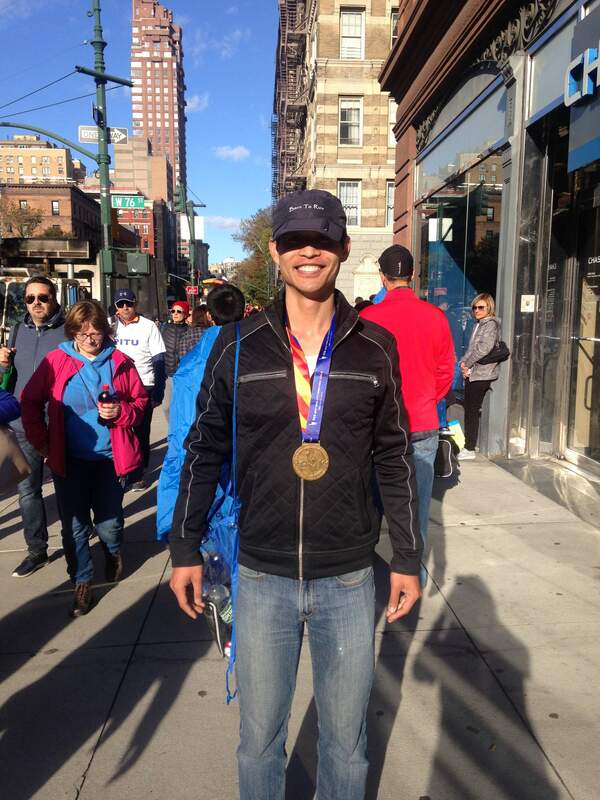 “I think I trained about as well as I could have,” I thought several times before the race. I was ready. Getting to Fort Wadsworth is no trivial matter. Fortunately, my friend Jordan warned me about this ahead of time, describing the process as “something of a clusterf*ck.” He got me mentally prepared for it. 4:15 a.m.: Woke up and dress. I only shaved, not showered. 4:30 a.m.: Sneaked out of the Brooklyn AirBnB I was staying at. Walked over to the metro a couple blocks away. 4:44 a.m.: Boarded the metro and then another 14 minutes later, transferred to another subway line. 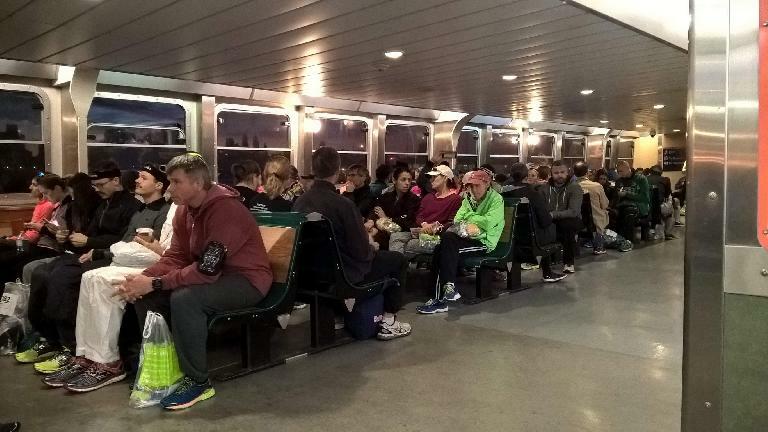 5:45 a.m.: Boarded ferry to Staten Island. 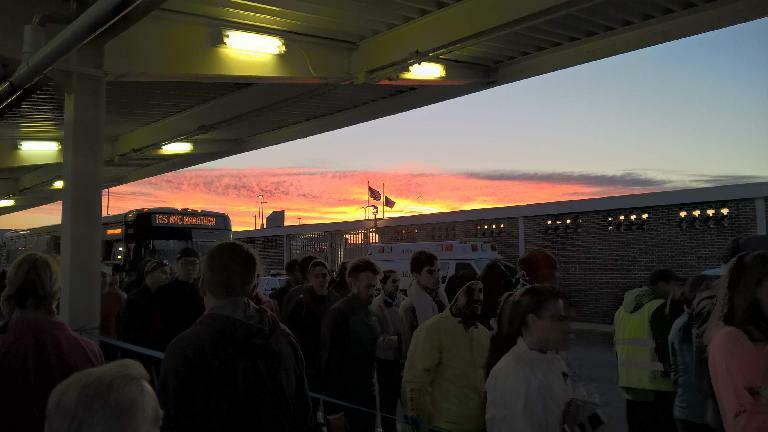 6:15 a.m.: Arrived at Staten Island. 6:25 a.m.: Boarded one of the numerous coach buses shuttling runners to the Athlete’s Village. 6:45 a.m.: Arrived at Fort Wadsworth. 7:00 a.m.: Got situated inside a huge tent at Athlete’s Village. 8:15 a.m.: Left the tent and successfully search for bagels. After doing so, plopped myself down on pavement, read a couple chapters of an e-book on my Windows phone, applied sunscreen and stood in line for the port-a-potties. 9:30 a.m.: Walked over to my wave start (Wave 2A) with only a few minutes to spare. While briskly walking over, my friend Nicole from Loveland (who was supposed to be in an earlier, faster wave) apparently saw me and yelled out my name, but unfortunately I did not hear her. Too bad because it would have been too cool to have seen her and to wish her well in person! 10:10 a.m.: Stood by for the national anthem. 10:15 a.m.: Commenced running with my wave. As you can see, it was not until six hours after waking that I actually got to start running. As Jordan said, this was the longest pre-race ever. But the time actually went by a little quicker than I thought it would, maybe because I knew what to expect and that I also managed to get in a short nap after bagels on the pavement. 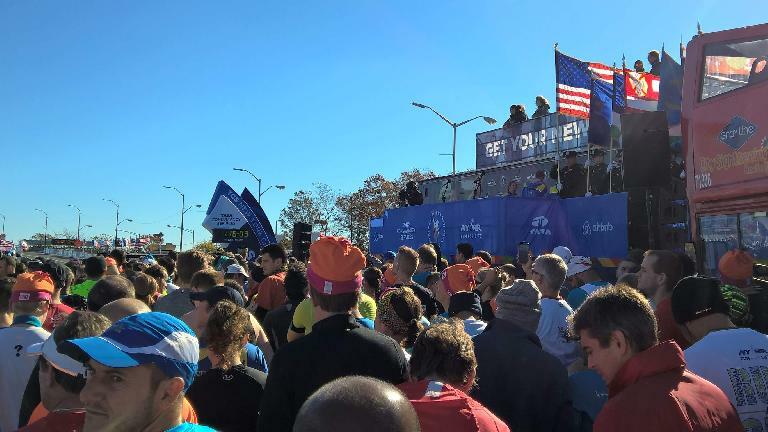 Despite trying to line up closer to the front of the wave, the first mile came and went pretty slowly at a 8:50/mile pace due to all the runners being bunched up like British soldiers in the American Revolutionary War. While this did not necessarily surprise nor alarm me, it was concerning enough that I ran the second mile at 6:38/mile. After that, I settled into a rhythm of mid-seven minute miles. The density of runners never thinned out too much and neither did the crowds lining the streets. Their whoops and cheers gave the racers more energy, I think, even though it was somewhat negated by frequently having to weave around other runners and not being able to run the tangents and thus the shortest distance possible on this course. I tried to stay steady and efficient, but it was kind of hard to when buddies were running four abreast giving little room to pass. Another factor were the undulations in the terrain. Multiple people had described the course to me as hilly, and while there was no climb that was frighteningly steep or long enough to induce cardiopulmonary arrest, there were enough ripples to make pacing a challenge. Remarkably, per the post-Strava data, my velocity remained remarkably consistent. 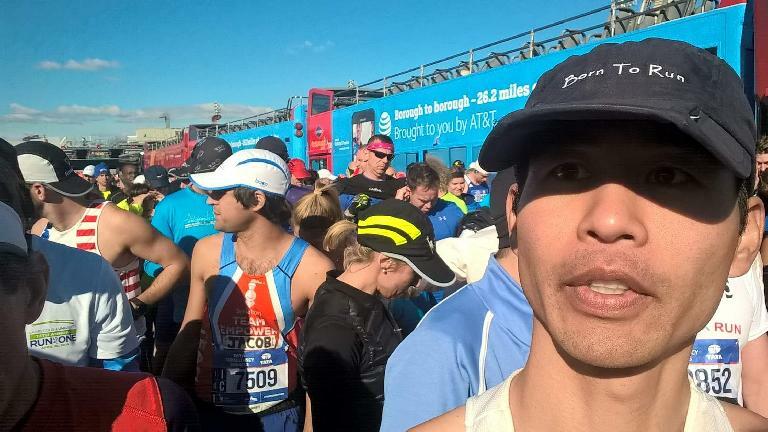 For the first 19 miles I felt like I was cresting all the hills like a finely tuned, blueprinted vintage Mustang; I was certainly passing a lot of people. By Mile 20 I still felt like I was in good shape. I had the screen on the Microsoft Band 2 off to conserve its power—I wanted it to record the whole race in its entirety—but the course had time clocks every mile or two. 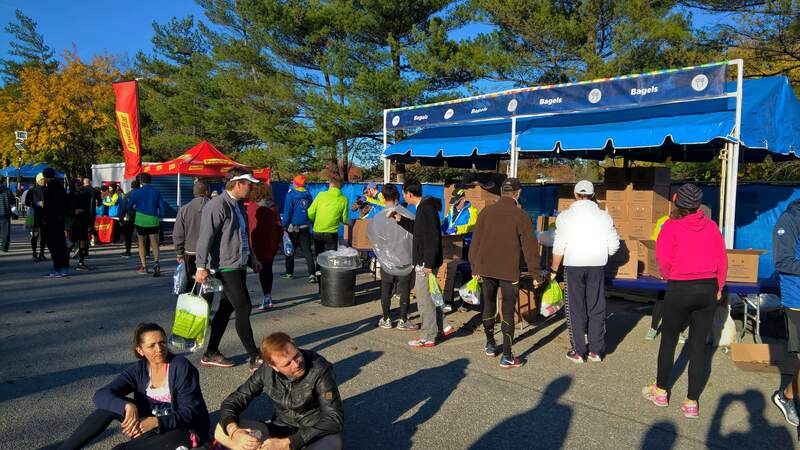 I had earlier determined that they read about 24 minutes, 40 seconds ahead of my actual time, so I did have some sense of time by doing quick mental calculations—something that became progressively harder to do as the race went on. I was definitely slowing around Mile 22, but by Mile 23 it seemed like I had about 30 minutes to do 3.2 miles. Instinctively I knew it was going to be close, but I felt like I had my 3:30 finishing goal in the bag. Still, I tried to trick my central governor into thinking I had more miles than I actually had to run to prevent it from shutting the body down. Such a technique seemed to work well in my last two road marathons. But then came the most significant climb of the day into Central Park, and I was no longer running the ascents well. In fact, I was starting to feel a little queasy. At around Mile 24.2 I heard my name called out. It was Bev, an old friend from the Tri-City Triathlon Club from when she and I lived in the San Francisco Bay Area. She had recently retired and relocated to Knoxville, Tennessee with her husband Greg, and of course I had left the Bay over eleven years ago. Before the race, through Instagram we both realized we were in New York at the same time; she told me she would be cheering for runners around this point and that she would look for me. So it wasn’t exactly a surprise, but it was super good to see her. I ran over to her side of the road to give her a quick hug, and off I went. That kept my spirits up for another half-mile or so. Otherwise, the proverbial wheels were falling off and I couldn’t help but think about the 2014 Fall Classic Marathon in which my legs completely gave out with 1.5 miles to go, sending me tumbling to the ground where I lay frozen for a dozen seconds until my muscles un-cramped enough to permit me to get back up. 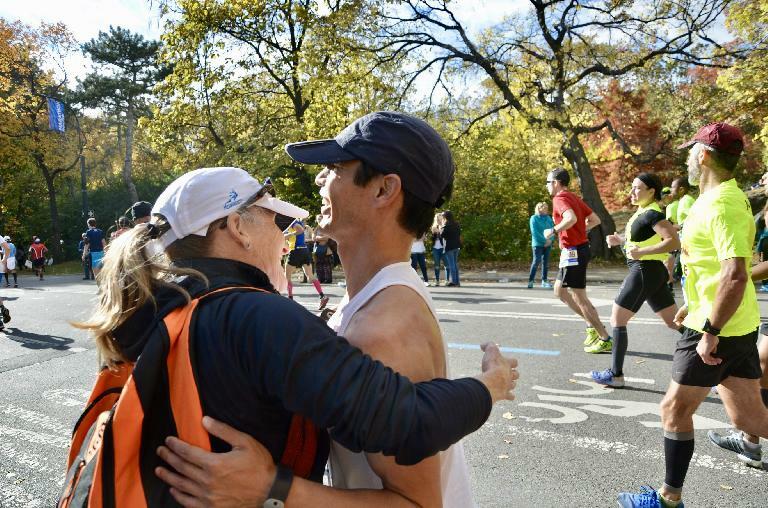 This time, I never felt a cramp coming on, but I my legs were telling me they were done and mental thoughts started to be enshrouded in a fog. And yet, I was so close and there was no need to panic. 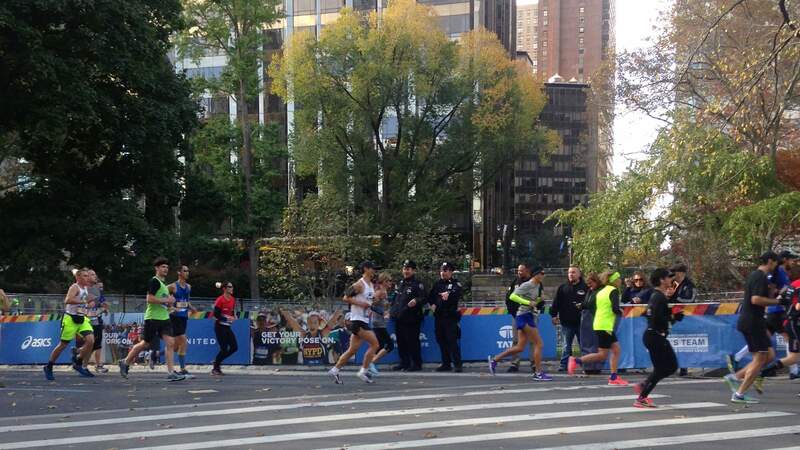 But during the final mile, I felt like I was about to pass out and that I was on the verge of needing to walk. But cognizant of the time, I mustered enough energy to keep on running and focused on at least maintaining pace. I lacked a huge sense of urgency but really felt like if I kept running, I was going to make it. Then I passed under the 800 meters to go banner—just half a mile. Early in the race I imagined that I would try to increase my speed here before a strong, powerful sprint—just as I had done in the 2014 St. Louis Marathon. But instead, I was doing all I could to keep pace. Then the Mile 26 banner came up. I heard my name called out—turns out it was Maureen who managed to talk her way into the sidelines of the finishing stretch. I couldn’t see where she was, though, and in my now disastrous state was doing everything I could to keep going. Finally, with the finishing banner in sight, I did not do my customary sprint. Instead, I merely cruised. Completely exhausted as I crossed the finish line, I pressed the button on the Microsoft Band… and saw that the time was 3:31:13. Yikes. Maureen would tell me later that my official time was 3:31:05. Double yikes. After obtaining a goodie bag containing liquid and drinks, I had to sit myself down on a curb and quickly imbibe entire bottles of chocolate milk and Gatorade before being able to get back up and shuffle my feet out of Central Park. It was nearly a mile to the exit, which gave me some time to think about what had happened. If only I had looked at my watch in the final mile, I thought, I would have known the urgency of the situation and would have sprinted. As it was, I felt like I imagine the Seattle Seahawks did in Super Bowl XLIX, when they made it to the New England Patriot’s one yard line with nearly half a minute remaining in the game. All they had to do was hand off the football to Marshawn “Beast Mode” Lynch once or twice, and they would have been in the endzone and won the world championship. Instead, they got too clever—actually, they completely lost their mind—and threw an interception instead. Game over. End of season. A dream unfulfilled. Likewise, I was only six seconds away from achieving my 3:30-in-all-three-U.S.-Majors goal. (I would have counted 3:30:59.) Which I certainly could have done if I had sprinted the final 100 meters as I normally do. It was a mistake that will haunt me for a little while. While nothing like the Super Bowl was at stake, it signified a missed opportunity, one that had been right there for the taking. I couldn’t help feel like I had choked. Just as a last-second victory for the Seahawks would have been the perfect way to complete a magical championship run, running 3:30 in my final U.S. Major would have been a dream way to end what had been a really good running season. So close! I drank only Gatorade every 3-6 miles during this race and refused any gels or solid food. After the race I felt a little dehydrated, but I still think that a Gatorade-only regimen remains the most effective refueling strategy for me based off of previous experience. My white Fort Collins Running Club jersey caused some pretty significant chafing under my left bicep and over my left lattisimus dorsi. I think for future marathons, I will have to revert back to my blue and white jersey. Before the race I felt like all the walking I had done in Philadelphia and New York had already made my legs a little tired. Yet, during the race I did not feel like this slowed me down any, even though in theory it may have by a few seconds per mile. Strava—which normally reads slightly too short or slow compared to my Windows phone or Microsoft Band—said that I ran 26.6 miles on this day. So the real distance I ran was probably 26.7 or 26.8 miles, or a half-mile too long. This is a definite downside of a big city race where running the shortest line possible is practically impossible.